In a hospital in Paris, Sam Alexander is being checked by doctors following his battle with Kluh. Sam is suffering from a broken arm and a major concussion which is causing him memory issues. However, the teenager insists on leaving the hospital so he can try and stop the inverted Hulk's rampage. On the hospital's roof, the doctor helps Sam put on his helmet and advises him to stay away from Kluh. Nova explains that lives are in danger and he couldn't live with himself if he didn't try to save them. As he flies into the sky, the young hero has an idea on how to stop the gamma-ray monster. Suddenly, Nova's damaged helmet stops working and Sam begins falling towards the ground! However at the last moment, the helmet reboots and Sam is able to save himself. Meanwhile, in Alaska, Eva and Kaelynn Alexander are sitting in a diner. Eva wasn't able to get money from the bank before they needed to evacuate from Carefree so she orders a coffee and a milk. Sam's mother watches the television broadcast of Kluh's destruction and worries about her son. Elsewhere at a SHIELD warehouse in New York City, Spider-Man has infiltrated the building looking for stored weaponry built by Reed Richards. He, and Steve Rogers, hope to find something powerful enough to stop Kluh. Just as he finds a possible solution, Spider-Man learns that Nova is missing in action. Just outside Carefree, the evil Hulk easily destroys a large bridge before heading towards town. At Carefree High School, Principal Philbin is rushing the students into the school's basement which was a former fallout shelter. Kluh lands in front of the principal and prepares to crush him. Suddenly, a power blast hits the monster in the side of the head. Sam informs him that his rampage stops now! When Kluh asks Sam what army did he bring with him, Nova responds by whipping one of the bridge's broken cables around him at superspeed. The inverted Hulk is caught off-guard and off-balance enough for the teen to carry him up into space. Sam remembers his high school science class lesson about escape velocity and pushes himself to obtain the necessary speed. Just as Kluh breaks free of the cable and begins to reach for Sam's leg, Nova throws him off into Earth orbit! As he watches his foe float further into space, Sam has a strange feeling that the Nova Force is alive. 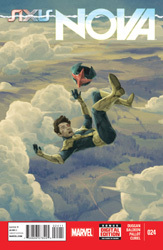 Suddenly, the helmet malfunctions again and Sam once more begins a long fall to Earth. For just a moment, Sam considers just giving up due to the pain his body is in. However, he refuses to quit because he knows he's a survivor like his father. The young Alexander grabs the Black Nova helmet and crashes into the town's skate park. After standing up and vomiting, Sam turns to hear the people of Carefree thank him for saving them. Later outside Avengers Mansion, Nova meets Carnage and introduces himself. Steve Rogers quickly takes Sam inside and sends Kasady away. Although Carnage has been inverted into a hero, Steve still doesn't trust him to be around Sam. Before they go inside, Spider-Man arrives in a giant robotic suit ready to fight Kluh. The former Captain America informs him that Sam has already taken care of the situation. The web-slinger leaves to return the armored suit and takes Carnage with him. Steve Rogers tells Sam Alexander that he's proud of him and also furious with him. Sam mentions that it seems like Steve has known him his whole life. The teenager also tells the aged hero that his helmet is damaged and, for now, he's grounded. Steve informs Sam that he saved a lot of lives today and his mother is also proud of him. The mention of Eva reminds Sam that he needs to bring his family home. In Alaska, Nova arrives at the diner. The diner's owner wants to reward the hero for defeating Kluh by buying him and his family dinner. While they eat, Sam tells his mom that his arm is broken. When Eva asks him if everything else is okay, her son hopes that their house is okay. The teenager's mother reminds him that they live in an apartment now. Eva Alexander realizes by Sam's response that his memory has been impaired by the fight. Elsewhere, Kletus Casady begins making a list of people he wants to help. The first on his list is Sam Alexander!